Other than a new taskbar, boot screen, logon screen and Aero features, Windows 7 includes hundreds of brilliant features under the hood. Many Windows 7 users are not aware of the fact that Windows 7 allows users to create system image disc, which can then be used to restore system to an earlier state via Windows Advanced Recovery feature. Advanced Recovery is one of the lesser known features of Windows 7. Using the advanced recovery methods present in the Windows 7, one can return Windows 7 to a usable state if it’s badly damaged. In the first method, Windows uses system image backup that you have created earlier using system image backup tool present in the Control Panel. You can follow our guide how to create a system image backup guide to create a system image backup. An option is also available to repair your Windows 7 installation using USB repair drive. 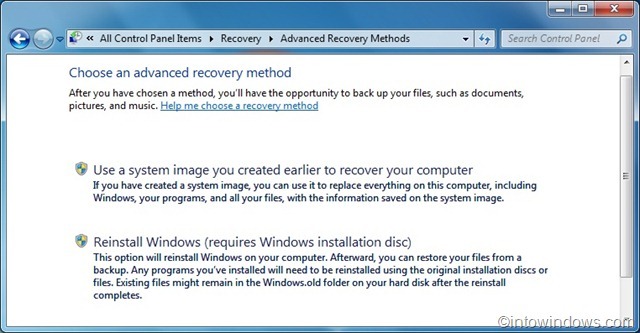 And the second method allows you reinstall Windows using either the original Windows installation disc or recovery image disc provided by your computer manufacturer. In the second method, your existing Windows 7 installation will be moved to a folder named Windows.old folder. You can go through our how to reinstall Windows 7 step-by-step guide for detailed instructions to easily reinstall your Windows 7 using the bootable media. In both methods, you will be offered to backup your files such as documents, pictures and music to a DVD, USB flash device or external hard disk. 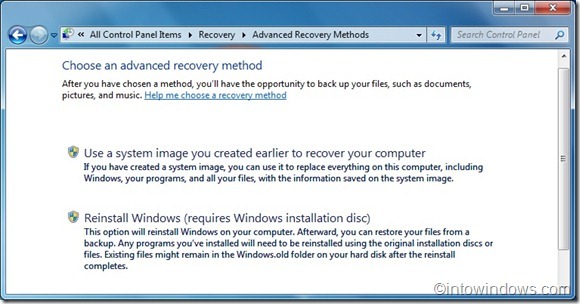 If one of your computers is running on Windows 8, we encourage you read how to create Windows 8 recovery disc and how to restore Windows 8 to factory settings guide. Also read: How to repair Windows 7 boot problems using startup repair. I have an HP notebook with windows 7 home premium. Since 9/22 have had problems with keyboard malfunction and startup. I have tried almost everything recommended up to trying advanced recovery option last night. But it did not work. Any suggestions?